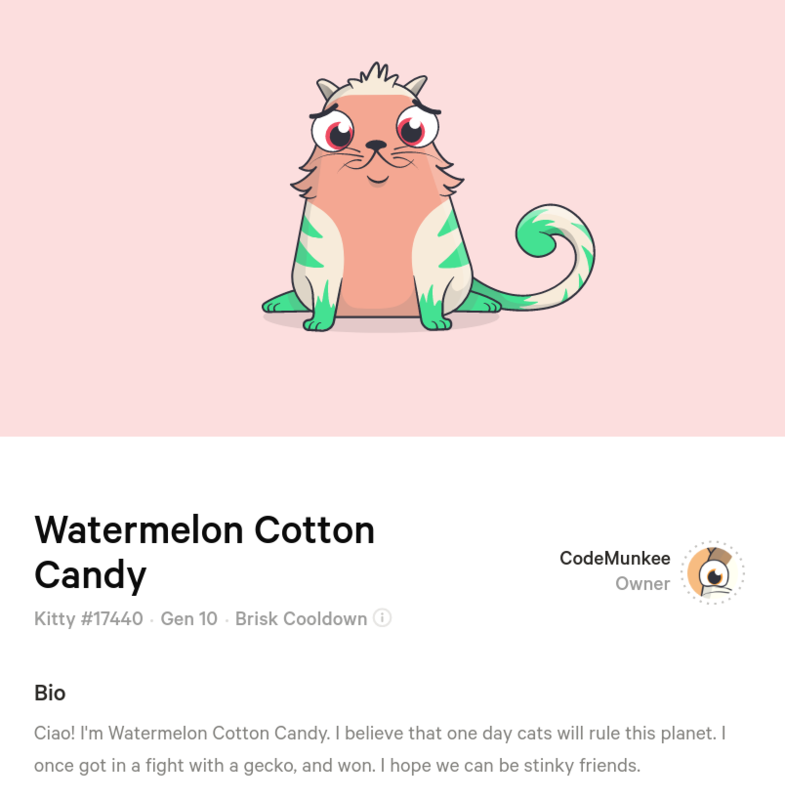 An army of collectible kitties has descended on ethereum’s public blockchain, demanding 5% of all transaction space, seducing everyone with their adorableness, and even fooling developers with their cuteness. “I’m so delighted to announce that after so many hours of personnel investigations and patience, I’m the proud owner of this lovely cryptokitty,” Julien Bouteloup‏, from the Mexico police shakedown fame, says. 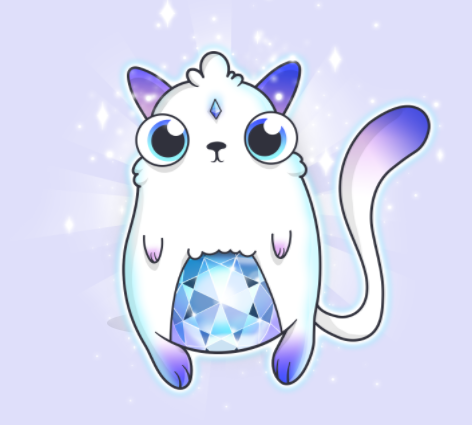 “I can’t believe buying/selling/breeding virtual cats is what made me finally purchase my first cryptocurrency,” a new etherean says. “I told my wife about crypto kitties. She immediately followed the instructions to make a metamask account, asked me for eth, and is now sending transactions on the network. I’ve been trying to get her to setup a wallet for years and gotten almost no response. Seems like kitties might be the key to adoption,” says another. Rare Kitty… don’t look, very seducing. Suddenly, these kitties are everywhere, with someone sitting down counting them to total 16,563 at this point in time. And they are growing! They breed! With the network itself creating what are called generation zero kitties every 15 minutes until next year. Then, once the cat army has fully invaded the blockchain, they will be more considerate with whatever limited space they have left and are to slow down gen zero production to zero, with breeding gradually taking longer and longer. Oh no! What? I for one welcome the new overlords. But these cute kitties are not just fun and games. Each one of them is unique, the project says, and each one of them is an ethereum blockchain token. Each one of them has a unique genotype and differentiates slightly from their parents, making them potentially the first intrinsically digital blockchain collectibles. As such, kids, or more correctly twenty-thirty somethings, might learn a thing or two about genes and how they transfer through generations. Which might lead to some very interesting cats if the underlying code does indeed try and apply scientific knowledge in the creation of new baby kitties. More interesting, however, may be the application of blockchain technology to what seems to be a very accessible, and perhaps even addictive, financially incentivized game. As the kitties are in effect a token each, and they are limited in amount, they can be transferred easily, not much different than transferring eth. Illustrating an interesting aspect of ethereum’s blockchain, tokenized property. From houses, to paintings, to goods, to cute cats. And as we are seeing, it is no longer something just talked about, but is actually here. So brace yourself for the coming doge invasion and pepe and lambo and unicorn invasion and… well, let’s say it before anyone else. As the increased efficiency in tokenizing assets, due to its added liquidity and ease of transfer, and as its benefits appears to be clear, anything that can be tokenized will be tokenized, soon-ish.